Sometimes it’s great to be impulsive and go on a last minute date, but in the case of this female dater, she would have been better off if she had gone with a friend or knew her date better before their first concert date. Wondering what happened? Read the latest entry to the Peril of the Week and find out why this date went south. This past week, I had an amazing opportunity to see one of the world’s most iconic musicians, Stevie Wonder in concert. But I needed someone to go with. On a whim, I mentioned this to someone I was chatting with on OK Cupid. He jumped at the chance to go. I did have hesitations on whether or not to go to a concert on a first date but given the superstar playing, I simply assumed there would be enough going on to make even the most awkward date, ok.
After arriving an hour late, my date suggested I drive to the venue, and could we stop for beers in advance. While I don’t drink, I do understand the importance of the pre-party so I obliged. Unfortunately, my date decided this would be a great time to down several 20 oz. beers, and this was all before he pulled out the 5th of generic whiskey to wash it down. At this point, he shared with me that he had just started drinking again this year and we hadn’t even gone into the concert yet. Once inside the venue, my date was determined to get us backstage. If you know me, you know how much I love this. All you have to do is figure out where the easiest way is to get on the floor and head that way. Right? No. Not for my date. Perhaps it was the alcohol at this point, but let’s just label this endeavor a mistake. We did find better seats though, maybe not the floor, but certainly better than our last row tickets. But this was not enough for my date and the mood was set for the concert and the mood was not fun. Imagine being seated next to someone exceptionally hyper, very buzzed and wanting more than what we have. It was not fun…so not fun that half way through the show, I suggested we leave. I still can’t believe that a 47-year old man chugged three 20 oz. beers and then pulled out a flask of Old Grandad before walking into a concert for a first date. Do you have a story for the Peril of the Week? Mobile apps for transportation have caused a huge paradigm shift in the way people are using transportation to airports or just on a party night. With New Year’s Eve, using your mobile app for companies such as Uber, Lyft or Sidecar will help you safely get to your destination. But what if these mobile apps can actually help you find love from the comfort of one of their cars? Meet Camille Bates and Ian Osborne, both who are Lyft drivers in San Francisco. Last New Year’s Eve, Camille was very sad after a holiday season filled with strife. She had ended her relationship with her boyfriend after a year of being together and was feeling down in the dumps. The last thing she wanted to do was to go to a New Year’s party and pretend to be happy. So instead of accepting a party invitation, the social-introvert decided her plan for the evening would be to drive all night to get party goers safely to their destinations. At around 9pm, Camille accepted a ride request from a gentleman named Ian. Coincidentally, Ian was also a Lyft driver on occasion. 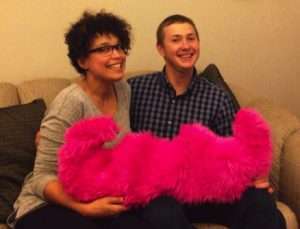 Camille had made a New Year’s resolution to follow her intuition and she figured he’d already been background checked by Lyft, so she agreed to join them. As Ian entered the car with his buddies, he instructed her to take them to a house party in the Marina. Ian was sitting in the front of the car next to Camille and his friends were in the back seat. Her passengers were singing songs loudly, and after Camille asked them about the party they would be attending, Ian casually asked Camille if she wanted to join them. While at the party, Ian’s friends decided to leave to attend another bash, leaving Ian and Camille to themselves at the original party. A few hours and glasses of champagne later, the two headed up to the party host’s roof deck to toast in the New Year. As the clock struck midnight, they shared their first kiss. As they looked over the beach on the Embarcadero in San Francisco, Camille reflected to a month earlier where she was gazing at the same beach when a shooting star appeared. Her wish was to find her soul mate. Nine magical months later, Ian asked Camille to marry him and they will be getting married in the summer of 2016. You never know who you’ll meet while using your mobile apps, or how a “pickup” will turn out. Wishing you much love and joy in cyberspace in 2015, or wherever you may roam. Julie Spira is America’s Top Online Dating Expert and Digital Matchmaker. She was an early adopter of online dating and is the founder of CyberDatingExpert.com. Julie helps singles find love in the digital age. For dating advice, follow @JulieSpira on Twitter and sign up for the free Cyber-Dating Expert Weekly Flirt newsletter. 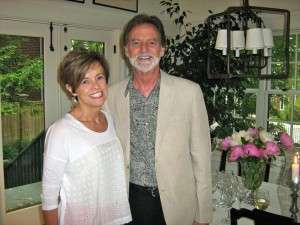 Meet Robyn and Richard who met on Match.com. Their cyber love story is an inspiration to all that if you stick with the online dating process, you can eventually find the love of your life. I was divorced and living in Los Angeles for nine years and dating in LA wasn’t easy. I was dating on and off for a few years online. I really wasn’t sure that I was going to meet someone. Like many, I got frustrated with the process, but I had met a woman in Los Angeles who went on 300 online dates! On date 300 she met ‘the one’ and they’ve been together for ten years. That gave me a lot of hope, but still the thought of 300 dates terrified me. What really kept me going is a man I met on match and dated briefly. Although we didn’t go the distance we became the best of friends. Within a year, he met his life partner on Match. That gave me even more hope. So I joined Match in January and had been searching within 12 miles of where I lived. I know that’s not very far, but with the traffic in Los Angeles, it seemed realistic to me. When my male friend, whose girlfriend lived in the Valley suggested that I expand my search to a town in the Valley called Woodland Hills, (I live near the beach), I found the zip code and typed it into the search to view men I would have never considered before. I didn’t even know where that town was. He emailed me back right away. We set up a phone date for the next day and it went to voicemail. Richard was waiting for me in the restaurant wearing a suit and a tie. He looked rather dashing. I thought, hmm. I might have just met my future husband, and it turned out that it did! I never thought someone of this guy’s caliber would be waiting for me at the end of the journey. I cannot even say how lucky I feel! If someone had invented the perfect someone for me, Richard would be it. I had been a member of Match for about four years and dated lots of people. Most were the typical one-and-done dates. I saw Robyn’s profile in my daily matches and read her bio. I was attracted to her, but I was intimidated by her experience as a newscaster and reporter. She had been living in New York and had traveled around the world. She appeared to be sophisticated and I thought I wouldn’t live up to her expectations, so I didn’t write to her. I was very thrilled when I received her email. In our first conversation, we had a lot to say to each other. I felt very comfortable with her when we met for a drink. She looked like her photos and like every guy, I was happy about that. We spent four hours talking and I knew I wanted to ask her out again. From our second date, we became exclusive and I actually knew after about 3-4 months of dating that I wanted to marry her. We talked about marriage and our future, but Robyn had it in her head that a couple needed to be together for a year or two, so she said she’d think about it. We moved in together and got a new apartment after 9 months of dating and then on our one-year anniversary of our first date, we were married on the beach in Malibu and are set for a Europe honeymoon. Congratulations to Robyn and Richard who prove that you can find love online. Do you have an online dating story to share? Send us your story and you might get featured in our Cyber Love Story series. Julie Spira is America’s Top Online Dating Expert and Digital Matchmaker. She was an early adopter of online dating and is the founder of CyberDatingExpert.com. Julie creates Irresistible Profiles for singles on the dating scene. Sign up for the free Weekly Flirt newsletter and share your story at Facebook.com/CyberDatingExpert. This entry for The Peril of the Week comes from Amanda, a 27-year old native New Yorker who’s living with her parents in Long Island. We’ve talked a lot about men and women who say they’re single, when in fact, their relationship status is, “Separated, divorce pending.” Amanda’s been dating online and thought she met a great guy with “Jerry.” Can you relate? Read about Amanda’s dating dilemma and feel free to share yours as well. My mother always told me I should try dating a man with children. They can commit and you like to cook…She said. (That’s the same logic behind dating a man in prison right? They can commit to hard time and I can bake them pies?) I decided to scope out the single daddy-scene and met ‘Jerry,’ a self described bachelor, father, financier and as I would learn later problem drinker. I arrived at the Jade hotel for dinner wearing leather Prada heels, (which I should have done a lap in beforehand) Paige denim jeans (that made my legs look like stilts), and a sheer blouse which my mother kindly says indicates ?an obvious padded bra.? I may not have Victoria Beckham?s body or budget but I promise you one thing, I am workin’ it. Jerry was shockingly better looking in person. (Contrary to most dates where the photo sent online looks like George Clooney and you end up meeting his 3rd cousin, a Japanese sumo wrestler.) ‘Jerry’ and I were instantly attracted to one another and we immediately delved deep into conversation. He whipped out his iPhone, displaying a gallery of pictures, his heart melting each time he spoke of his gorgeous children. This quickly switched to talk of his ‘ex’ wife who I could have easily mistaken for Cruella Deville. 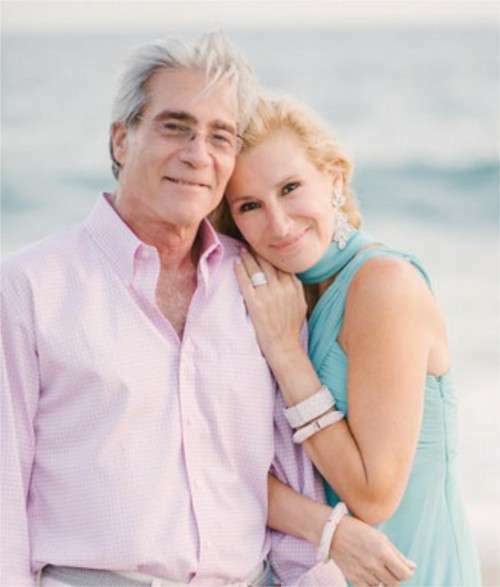 ‘Jerry,’ a well-known financial executive, traveled often which made me realize a relationship would be impossible. (Why didn’t this occur to me beforehand? Well that would indicate a trace of commonsense yes? ) As our meal progressed, I noticed ‘Jerry’s’ story regarding his ‘situation’ began to crumble. ‘Jerry’s divorce turned out to be in litigation and nowhere near final. I was afraid what I would find out if I offered him some SAKE! Was he really a woman? My friend ‘Demi’ told me something very smart once. “It’s very easy for a man to remove a ring. Who knows how many men say they are divorced that we have dated?” Seven glasses of wine later and it was time for the check. 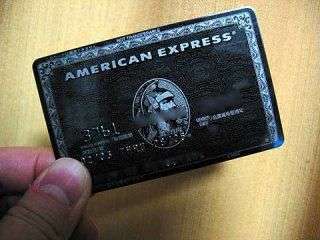 ‘Jerry’ pulled out his black card and handed it to the waitress. “I’m sorry sir, it’s declined!” she SHOUTED! I was actually under the impression that black cards had an unlimited spending limit but did someone not pay their bill? He looked as if he had seen a dead relative (shocked) and handed the server another card. Here is a tip to all men: Call your credit card company before going to dinner and be sure to conjure up a convincing story. Even if it is a lie learn your lines. While dating online, have you you ever wondered if the email you sent to a potential date was actually read? Do you assume that once you push the send button, that the person on the other end will decide if you’ve made the cut or not? 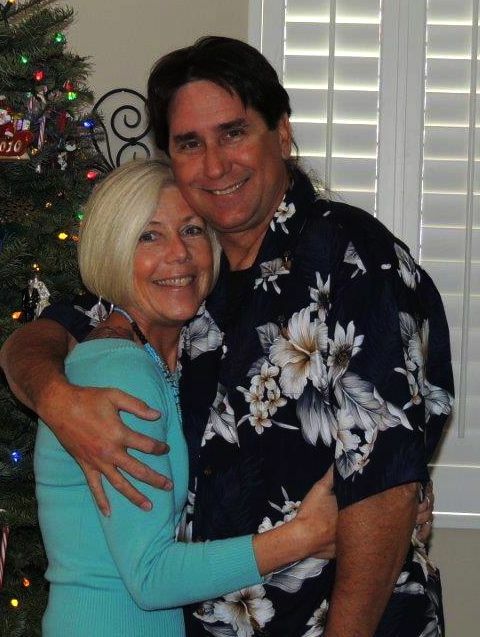 Meet Diane and Steve, our featured cyber love story couple who met on eHarmony and have quite a romantic story to share with a magical happy ending, or is it a new beginning? Steve was one of the first men I noticed and I was instantly attracted. He said he was too. What clinched it for me was his ability to write and express himself clearly and with proper spelling and grammar. Silly maybe, but since I?m a writer that’s important to me, plus it gave me real insight into his character. Somehow, by mistake, we bypassed the controlled communication part of eHarmony and went straight to emailing each other through their website. He quickly explained he was going out of the country for a few weeks to work on a project so we would have to delay meeting. We sent a few emails back and forth before he left, but then there was nothing for about a month. Nada. I feared the worst (he’d found someone else or lost interest). Meanwhile Steve was thinking the same about me. But what had actually happened was my last email to him had somehow timed out or gone astray so he thought I’d stopped communicating. I thought he hated what I’d written so had backed off. Fortunately, he took a leap of faith and contacted me again when he returned. I was elated. We met for the first time over coffee shortly after that, agreeing we’d also go out for dinner that night if all went well. And it did. The rest is history as they say. We more than hit it off. We began seeing each other all the time, going out to concerts, watching movies and cooking beautiful meals together. We shared our life stories, our triumphs and our heartbreaks, and began to blend our two worlds together. Last summer we had a beautiful backyard wedding with 50 of our closest friends and family members. It was a magical day. Everyone danced, even the old folks in their 80s. Steve was 62, retired and a widower when I met him. I was 56 and divorced. We are deliriously happy in our new life together. Our story proves it’s never too late to find true love. Congratulations to Steve and Diane who found an other chance at love. 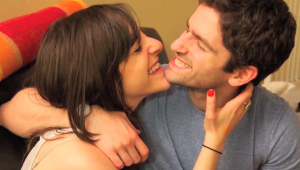 Are you an Internet dating success couple? Send us your story and you might get featured in our Cyber Love Story series. 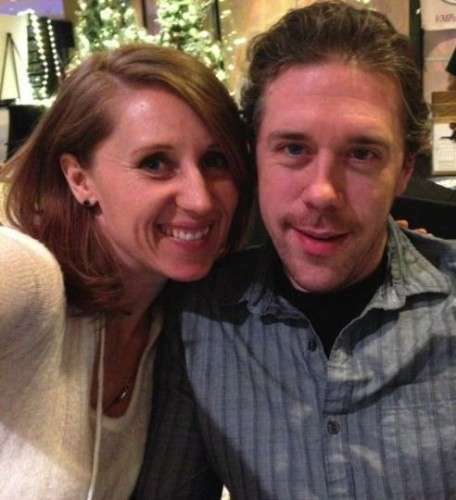 Meet Elizabeth and Michael who found love online on PlentyofFish. Here’s what Michael has to say about his online dating journey. For our first date, Elizabeth and I met at a wine bar on a Thursday evening. We had been communicating for a couple of weeks before hand. Mainly by text. We exchanged messages on POF for a day or so and then exchanged phone numbers. She ordered a white and I a red and we split a plate of various cheeses and cold cuts. We had planned on playing trivia; a weekly thing that bar does, but we skipped it because the conversation was going so well, well enough to warrant a second glass of wine. 8:00 turned into 9:00 which turned into almost 10:00. There was some lip locking at the bar. We didn’t much care for who was around us. We called it a night and she gave me a ride to my car. It was quite cold that evening. We agreed to get together again on the weekend, which we did on Saturday. Date number two was fantastic. After getting somewhat lost, I picked her up and we headed for downtown. I had offered to take her ice skating, which I hadn’t done since I was about 11 years old. (I?m 41 now). So we went in circles around the rink, me gripping the rail in one hand and hers in the other. Maybe I was just being sneaky. There were a few falls, but that was okay, it was good for a laugh. After, we had hot cocoa and walked a bit. Then it was off to the airport to look at the stars, which we didn’t really see due to the clouds. I don’t think we would have noticed them even if the night were perfectly clear. What the date was meant to do was to live out some of the things we had been talking about when we were texting. We spent the rest of the night together. Fast forward to now. We’ve been seeing each other regularly, about three days a week. I’m writing this email from her living room. We have future plans for time together and things to do. 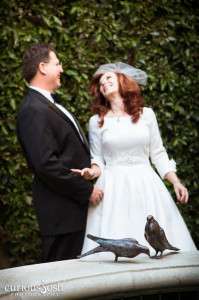 Congratulations to Elizabeth and Michael who met on POF.com and became Facebook official a little over a month later. Digital wedding bells were ringing at the Social Media Wedding of the year of our favorite Tweethearts, Marsha Collier and Curt Buthman. 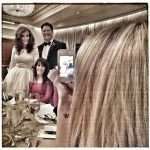 Marsha and Curt once again made social media history on November 8, 2013 at the Peninsula Hotel in Beverly Hills, CA, where they tied the digital knot to the crowdsourced Twitter hashtag of #MarshaandCurtWedding. This wedding was the first-ever where a Bride walked down the aisle wearing Google Glass to capture both video and photos of the ceremony. 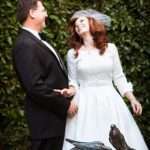 As the couple said their marriage vows, again they recorded yet another social media first, where they captured their “I Do’s” in a six second Twitter vine video for their friends and followers to enjoy as they followed the digital festivities. It was an honor and joy to share this beautiful day with my friends and to share this social media love story with you. So how did this Twitter love all begin? As the author of over 40 books, host of the #custserv chat on Twitter, and named by Forbes as one of the Top 10 Women Social Media Influencers, when it came to her love life, there was no doubt that she’d attract a handsome man with her social media presence. The couple, both social media enthusiasts, originally started following each other as friends on Twitter in 2009.? 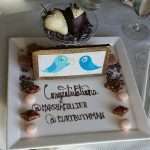 As I sat with them in the Bridal suite before the wedding ceremony, they shared their favorite Twitter moments with me. “One day I was stumped as to how to change a lightbulb,? said Marsha. “I turned to the twitterverse and asked, ‘Can anyone help me? Is there an electrician out there? '” Curt came to her rescue and send her a private message and their friendship turned into a digital crush. The two eventually met in person (IRL) at BlogWorld, the world’s largest social media conference, where Marsha, author of over 40 books, was autographing copies of two of her books, eBay For Dummies and Facebook and Twitter For Seniors For Dummies at the Wiley booth. The rest is Twitter history. Their crush turned into a digital romantic journey, complete with the first Twitter vine video marriage proposal in May of 2013. 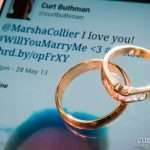 Curt’s creative proposal with the Twitter hashtag of #WillYouMarryMe went viral and was featured everywhere from People magazine to the Daily Mail in the U.K. It was no surprise that their wedding ceremony would be filled with a few more social media firsts…The first Google Glass bride and the first Twitter vine video marriage vows. 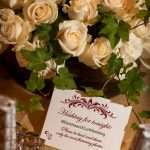 As Marsha was selected to be one of Google’s exclusive “Glass Explorers” and is the co-host of the Computer and Technology radio show, she couldn’t resist the urge to continue to be a leader in technology on her wedding day. 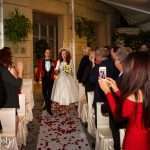 In an elegant wedding to remember, the Bride was walked down the aisle by her first cousin, British Army Colonel Simon Goldstein MBE. She was wearing a vintage A-line bridal gown she selected from Unique Vintage in Burbank, CA. As the dress was a few sizes to large for her, she had it completely custom fit and added a pocket to carry her Samsung Galaxy Note 2 phone and lipstick. Social media friends were snapping photos throughout the evening and posting to Twitter, Facebook, Instagram, and Google+. The service was officiated by social media friend Jeff Rago and the Bride’s daughter Susan Dickman was the Maid-of-Honor. As expected, their wedding hashtag of #marshaandcurtwedding became a trending topic on Twitter. At the end of the digital day, Curt admitted he was attracted to Marsha’s Twitter profile photo when he started following her. Need I say more? It’s all about the profile photos. Julie Spira is an online dating expert and founder of CyberDatingExpert.com. She creates irresistible profiles for singles on the dating scene. For more online dating advice, follow @JulieSpira on Twitter and sign up for the free Weekly Flirt newsletter.